In case that you missed it. 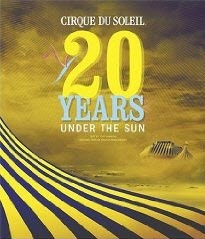 I created a book review video in October for the book “Cirque Du Soleil: 20 Years Under the Sun – An Authorized History” (Hardcover) by Tony Babinski (Author), Kristian Manchester (Contributor). I also uploaded this video review to Amazon.com, which is shown on the product detail page of the Book on their web site now. I find that pretty cool hehe. As I said indirectly already, the book is available for purchase for about $37 (USD) at Amazon.com and here is the video review of the book. My review in text format follows right below this embed video. Backup URL to Video on vimeo (https://vimeo.com/92736347). The book is a monster in size and weight and packed with glossy images of the Cirque and its shows and provides a interesting behind the scene look at the humble origins of the enterprise and its worldwide successful shows. It’s a good gift for somebody who is interested in the Cirque, beyond just the acrobatics. Other people probably won’t appreciate it as much, so check first, before you make the $37 investment for this book. The book was published in 2004 and probably written in 2003 to early 2004. That means that many of the Cirque du Soleil shows are missing in this book. Cirque du Soleil was very busy over the past four years, since this book was published. The last touring show covered by the book is “Varekai” and the last residential show “Zumanity“, which is performed at the New York, New York hotel and casino in Las Vegas, Nevada. The show “KA” at the MGM is barely mentioned, not even by name yet and there is nothing to be found about the touring shows “Corteo” and “Kooza“, the Las Vegas shows “Believe“, “The Beatles – Love” and as I already mentioned “KA“. The new resident Asian shows “Zaia” and “Zed” are of course also missing. The music concert “Delirium” is also not part of this book. All those shows were created after 2004. This is quite a lot of shows, so I can only say again, that you better make sure that the person who you would like to buy this book for can actually appreciate it anyway. All the new stuff is missing, but the more it covers the early Cirque and first shows that are not running anymore, such as “Fascination”, “Le Grand Tour“, “La Magie Continue”, “Cirque Reinvente” and “Nouvelle Experience”. Also covered are the still running and touring shows “Saltimbanco“, “Mystere“, “O“, “La Nouba“, “Dralion“, “Alegria” and the mentioned “Zumanity” and “Varekai“. The special anniversary show for the 20th anniversary of Cirque du Soleil at Montreal “Midnight Sun” is also not mentioned. Keep in mind that this special performance happened also in 2004, the year when the book was published for the same reasons. I don’t know, if the book is also available in other languages than English, but I would assume that this is the case. It should also be available for purchase at any other well sorted book store, other than Amazon.com, such as Barnes & Noble or Borders. I hope that you found this brief review helpful. Let me know via the comments section below. To learn more about Cirque du Soleil, check out my Cirque du Soleil primer, here at RoySAC.com and also my special YouTube account “CirqueDuSoleilGuru” for Cirque videos and my Cirque du Soleil photo album collection at the photo sharing web site Flickr.com.